Just over a year ago when I rebooted this blog I mentioned making legs for a friend's table. Well, it took a year but I got pictures of it this week and figured I'd share. To give you a little background on this table, my friend - who we are calling Mike - built a gaming table top over ten years ago. 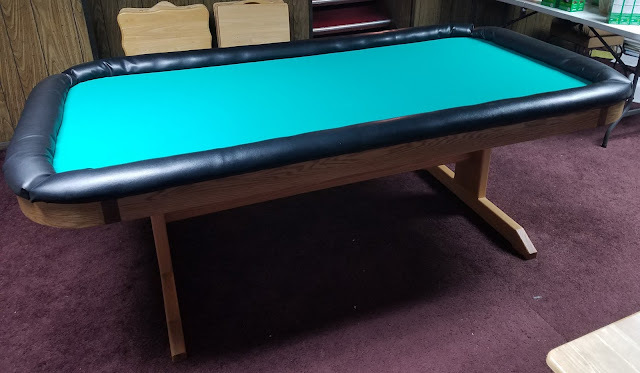 It isn't as fancy as some of the multi-tier roll playing gaming tables I've seen but it has a number of really cool elements baked into it. The table is basically a sheet of plywood with the corners rounded trimmed with a combination of red oak and walnut. The top is covered with speed fabric over some closed cell - poker - foam. 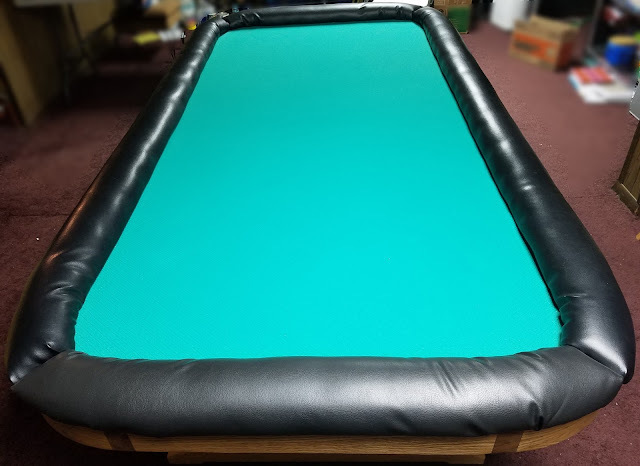 He created some padded rails around the edges to help keep dice from rolling off the table and to make the table more comfortable to rest your arms on. To make sure I'm clear. Mike built this table top in my workshop. I provided help and guidance but the labor and skill was all his. Frankly, I think he did a spectacular job and the table is beautiful. It also shows how accessible woodworking can be with just a little help. I recently upgraded the legs with what you see in the above picture. 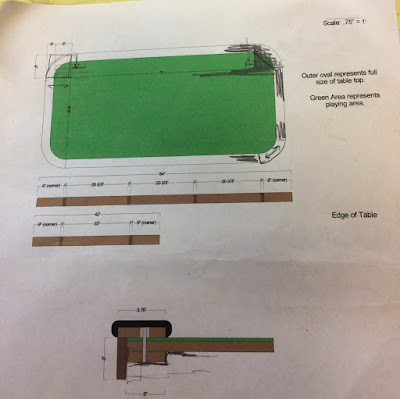 In my recent workshop cleanup I came across the plans we made. Let's look a little more closely at the trim around the table. As I mentioned earlier the table top is built from a relatively sturdy plywood base. We added the hardwood trim to cover the rough plywood edges rather than as a structural element. 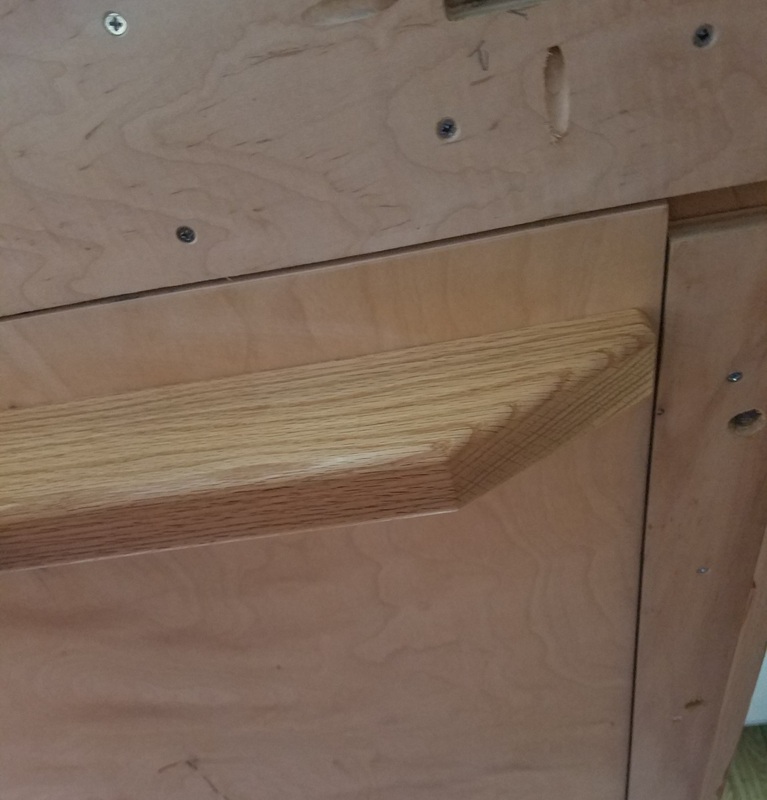 We didn't use any fancy joinery techniques, we basically just glued and tacked it in place with brad nails. I think if I was going to do it again I'd just use glue and some clamps to hold everything in place. The nails don't look too bad but we could have done better. That one is all on me. We debated on how to build the corners. We discussed bending plywood but in the end Mike chose the safer route which was to stack up plywood and cut it into a curve. I don't remember exactly how we made the curve; however, I suspect we cut the pieces out, glued them together on a form then used my stationary sander to make the curves true. Mike then cut some oak veneer and used wood glue to the curved form. The top is the best part of the table. Mike researched poker table surfaces and came up with this combination. The foam underlayment has just enough give that when you want to pick up a card or chip you can gently press on one side and the other side pops up making it easy to get hold of. Have you ever had to damage the edge of a card because it was laying flat on a solid table top? Not on this one. Yet the top is firm enough that when we are playing games with tippy plastic bits there is no issue with them falling over. The black vinyl arm rests around the table provide a couple of uses. First and foremost they are a comfortable place to rest your arms while sitting at the table. They also provide a nice transition between the foam and the wood skirt around the table. Mike didn't have to be super precise about trimming the foam or the speed felt. Mike built these by wrapping plywood and foam with vinyl fabric which is stapled on the bottom. The corners are a bit ugly but that's because neither Mike nor I are upholsters - though I did watch all of The Furniture Guys episodes. Corners are hard, round corners are still hard. Why am I going to talk about the underside of the table? Mostly because it is relevant to the whole leg situation. Why yes, the top is quite heavy but that was purposeful. There's little that is worse than having a gaming table that flexes when someone leans on it. Much like with woodworking tools, mass helps dampen vibrations and strength reduces the flexibility. Games that have lightweight pieces can be disrupted if the surface moves too much so this is all good. Normally when building furniture you'd have a good idea of what the entire thing will look like before you get started. In this case Mike hadn't decided what kind of legs to put on his table so we put temporary legs on the table. These were simple 2"x2" poplar legs that we created pockets for in the ends. It was pretty clear that these legs needed to be very temporary. I'm not sure when I offered to make Mike new legs for the table but it couldn't have been too long after we'd first set it up. I think I'd renew the offer every few years, re-measure the underside of the table and then not follow through. A year and a half ago I finally followed through with my offers. 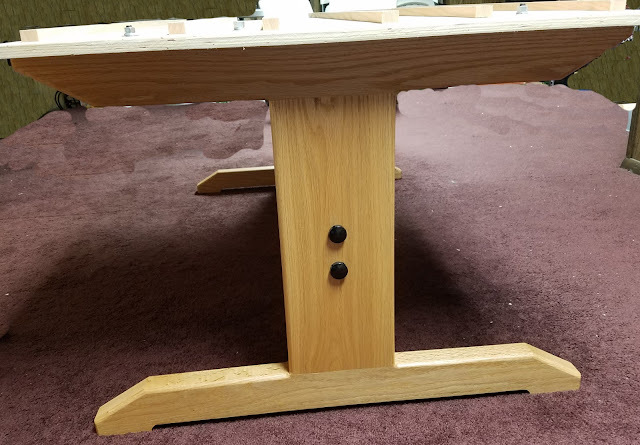 After some discussion with Mike we agreed that trestle table legs would work well, especially, since there are often people sitting around the corners of the table. Having a couple of people sitting at the ends we figured out how much to inset the legs so that people wouldn't be constantly banging their knees. To fit with the trim around the table and to keep the price down we went with red oak. To make sure the legs were sturdy we went with 8/4 stock. The challenge was in how to attach the new legs to the table. Mike also wants to be able to get the table out of his house some day if he ever decides to move. This meant the table needs to be able to be disassembled and reassembled. One of the thoughts I'd had was putting pegs on the top leg rails that would slip into the same pockets we were using for the 2x2 legs. The problem was that the holes were not a good distance from the ends of the table (i.e. the legs would be uncomfortably close to the ends). 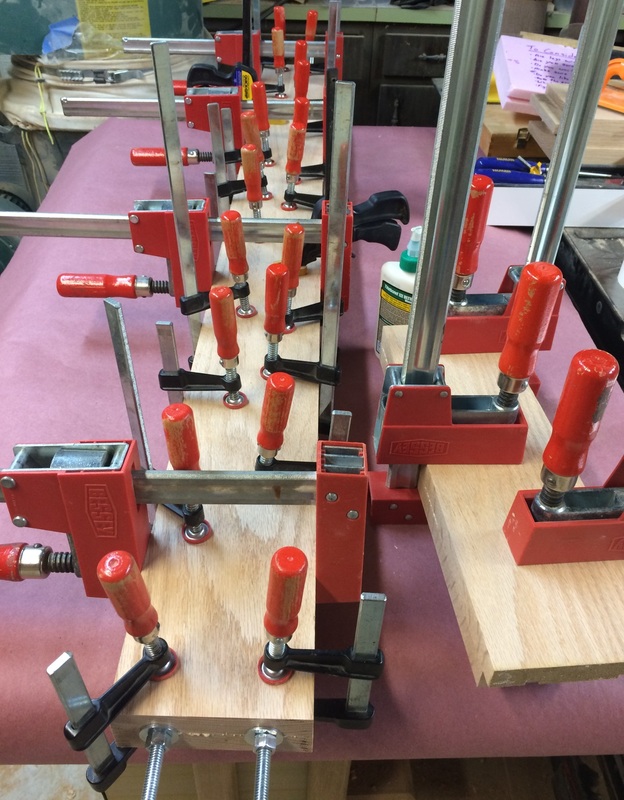 I thought about making plywood plates that I could mount the pegs on that would allow me to shift the legs inward. 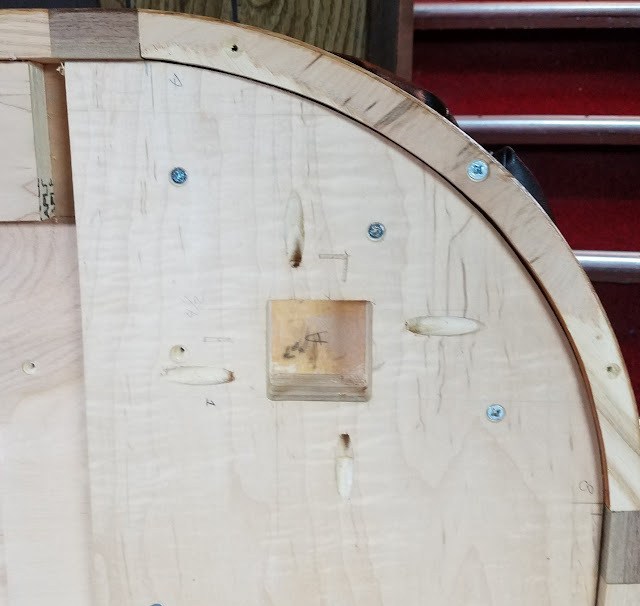 The challenge with that was the lack of space between the bottom of the skirt and the plywood bottom. If I added anything too thick it would stick out and be both unattractive and uncomfortable. 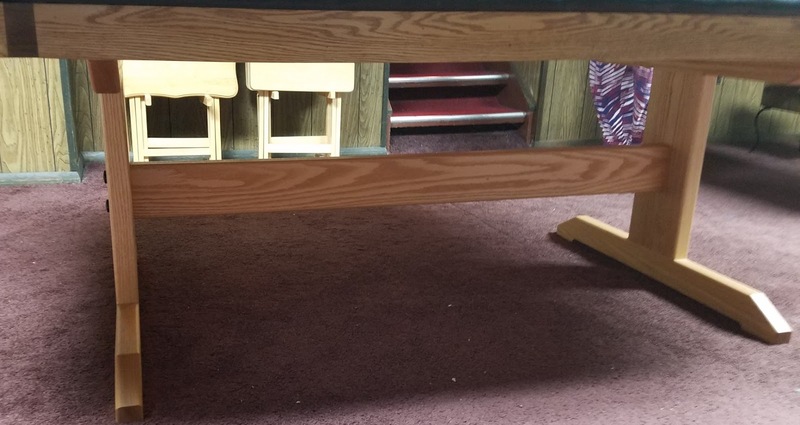 As you can see from the above picture the ends of the table are built up but there is a gap in the middle. 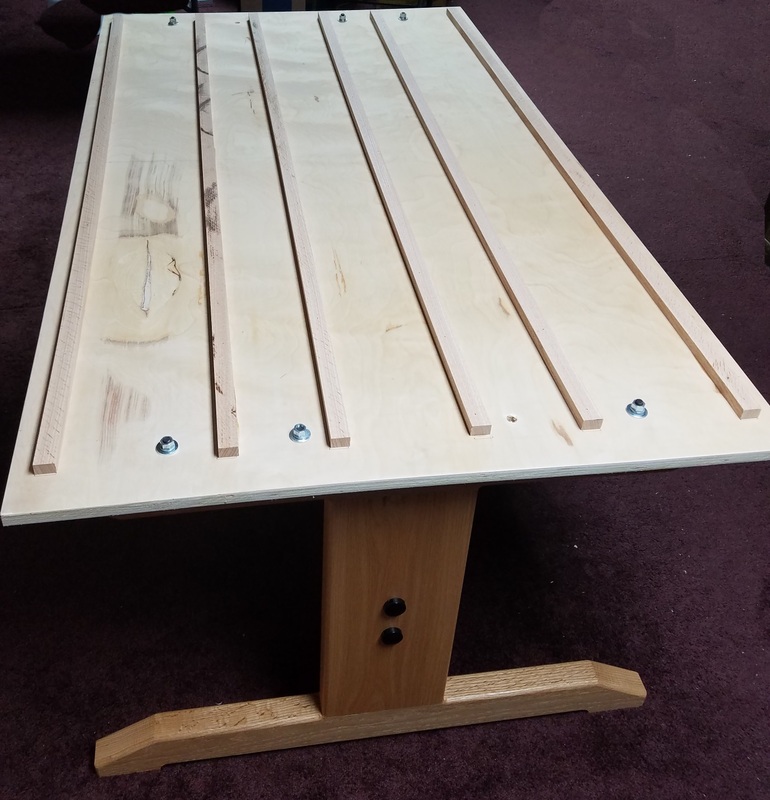 After some careful measurement and thought and staring at the bottom of the table I decided to build a sub table - a table that would fit beneath and inside the table top. What I did was cut out a piece of plywood that fit the larger gap on the bottom and then added some hardwood cleats out of some scrap I had lying around to help stiffen the plywood a little bit. My shop isn't in Mike's basement so I made the plywood under-top and cleats using some careful measurements and a story stick. I used some scrap to make a proto-type of the top. It was only one inch wide but it allowed me to triple check that the top was going to fit. It worked like a charm and fit like a glove on the first try. All the extra care and caution was worth it. To attach the legs to the under-top I used four hanger bolts on each end. Technically, I used three on each end because my local DIY store only had six of the appropriate size. I drilled for four so if Mike ever feels like it he can just add the remaining two bolts - one on each end. Onto the main attraction! The legs! To make sure Mike would be happy with the layout I started by making a single set of legs from 2" thick foam. Unfortunately I don't think I have any pictures of them. They look essentially identical to the wood ones - or is it vice versa - but were made out of pink closed cell foam insulation. But they were effectively a full-sized mock up so Mike could get a better feel for how they'd look in relation to the table. There's really not much to these legs. There's a foot, a post and a rail across the top. To make sure the feet came out consistent I made a template for the ends. 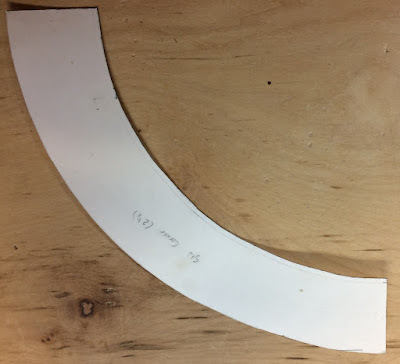 I used a Forstner bit to make the radius and cut the long straight on the band saw. I used a straight edge and a pattern bit with my router to clean up the rough cut and then some sanding to make it all look good. 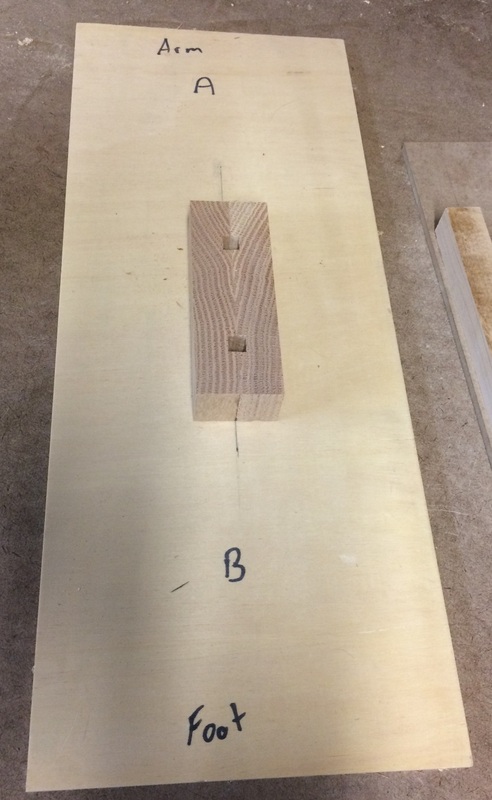 The leg posts are attached to the arm and foot using pretty beefy mortise and tenon joints. I made the tenons on my table saw using a dado blade and my fence. I unfortunately learned something new about my fence. The wood was pretty heavy and in the process of keeping a firm pressure against the fence my fence slipped. This fortunately didn't ruin the leg but it did make the tenons longer than I'd planned which made the top a little shorter than Mike wanted. 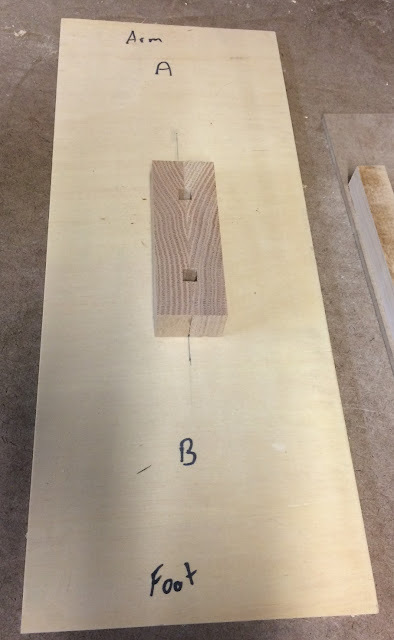 I made the mortise in the foot and arm using my router and a template. There is one long rail that attaches the two legs together. The picture on the legs gives a hint as to how everything is all attached. There are two threaded rods that run the length. 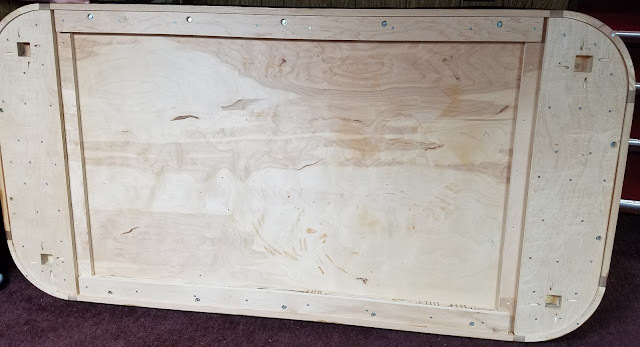 Instead of buying a six foot drill bit I bought two 4/4 red oak boards, used my tablesaw to make two long grooves and then glued them together to make one long board. 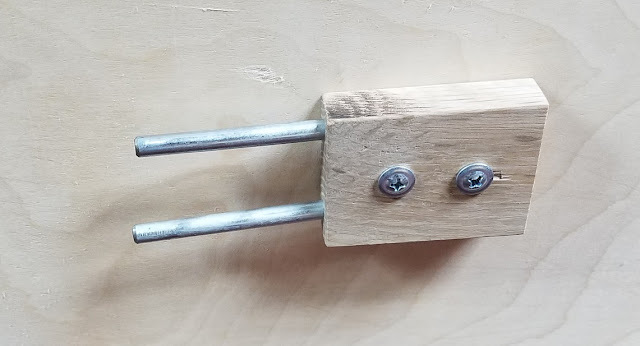 I could have used hanger bolts again; however, I really wanted to be able to crank these things tight and I didn't want to have any worries of stripping a hanger bolt out of the wood. By having a steel rod running the length all of the forces are on the rod and not the wood. Yup, that's a lot of clamps. I could use a few more I think. Note: In the upper right you can see the legs with their tenons and a piece of the pink foam board I used for the prototype. I'd kept it around because it had key measurements written on it. You can see the ends of the threaded rod sticking out. I went ahead and glued everything up with the rods in place so I could be sure that everything was aligned properly and that I didn't have glue squeeze out that might keep me from inserting the rods later. Since I wasn't sure if I was going to be able to get the rod out after the glue dried I cut the two boards to final length and then used some bolts and washers to make sure the ends were aligned. After the glue dried I used my sawzall to cut the rods to length and a new angle grinder to remove the burrs. The next challenge to solve was getting holes spaced properly and consistently on the legs. I handled this with another jig - see I am learning, ten years ago I probably would have tried free-handing it. In the picture of the rail glue up you can see on the right hand side how I glued up my off-cuts too. I was able to slice a little bit off the end and use it as a template for spacing the holes in the legs. To make sure they were positioned correctly I attached it to a piece of plywood the same size as the leg post. I could just clamp it in place and use my hand drill to make the holes. The bolts are captured on each end using specialty hardware I sourced from Lee Valley. These Tension Rod Nuts have 1/4" holes that you can use to tighten them down. I got cheap at the last minute and decided to not buy the little pre-made rod they sell for $1.40. When we put it all together I tried using a screw driver which didn't have a 1/4" diameter and the holes weren't deep enough to really get a good purchase. I tried 1/4" oak dowel but it wasn't strong enough to really crank down on them. While I love Lee Valley their shipping prices do not encourage making small purchases so instead of buying a $3 worth of steel rod and paying as much or more in shipping I went to my local DIY store and bought a length of 1/4" steel rod. I cut them to length with a hacksaw and used my grinder to remove any burrs. They worked spectacularly and really made the table solid. I also made Mike a little holder to screw to the bottom of the table so they wont get lost. I'm really happy with how the legs came out. The mid rail is the perfect height to rest your feet on when no one is looking. The legs are in far enough from the ends that the table is comfortable to sit at anywhere. And best of all, once we used the metal rod to tighten the nuts on the ends the table is super solid. I'm not a small person and I can 'bump' the end of the table walking past and it doesn't wiggle at all. This is a great set of legs to compliment a spectacular gaming table top.